Around March, every year, the dangerous Pine Processionary Caterpillar comes back to life. These insects are especially dangerous to both humans and animals and can cause various highly allergic reactions to the skin and mouth if ingested. If, while on its walks, a dog plays with or eats one such caterpillar, it can cause great damage to its mouth, leading even to surgery and deformation. The Pine Processionary Caterpillars can be found in nests in pine trees, very common in Cyprus. They are mostly encountered during the month of March and beginning of April, before they become moths, although they tend to appear earlier and earlier, and sightings have been reported even at the beginning of February. When one such nest falls on the ground the caterpillars will form nose-to-tail columns or variously shaped groups. They are protected by severely irritating hairs filled with toxins. If touched, the hairs rise and release the toxins causing irritations and burns. Severe cases have been presented to the Animal Aid Welfare & CCP clinic in Kato Paphos throughout time: Fly, a hunter x puppy has had to have half of her tongue amputated after having eaten pine processionary caterpillars, and Bobby, a small but very active Chihuahua found the dangerous insects at the bottom of the garden where he lives and touched one – a small part of his tongue is now missing. So many other animals have come into contact with the small yet dangerous caterpillars and most have had to suffer as a consequence. So, when you take your dog for a walk, ALWAYS keep him/her on a lead. 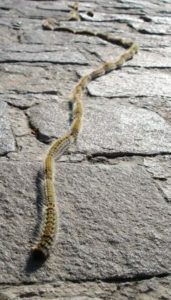 During the months of March and beginning of April, keep an eye out for clusters of pine processionary caterpillars and avoid them before your dog sees them. It is best to avoid areas where there are pine trees; however, if they cannot be avoided, make sure you keep your dog on a lead and away from the pine trees as much as possible. Ideally, all dogs must be trained so as not to touch anything on the ground.